Trace body onto wrong side of flesh fabric. Stitch, turn and lightly stuff legs. Topstitch up centre of legs along line marked on pattern to separate legs. Stuff body firmly and close opening. Hand stitch Lurex around body to form leotards. Gather up long edges of skirt pieces, pull in to fit waist and stitch to body. Trace arm onto wrong side of flesh fabric, stitch and turn RSO. Stuff firmly, close opening and sew to shoulders. Trace head to wrong side of flesh fabric, stitch, turn RSO and stuff. Paint or draw on features. Sew head to neck using a ladder stitch. Glue mohair to head. Join short ends of ribbon with a flat seam, fold in half and twist in the middle to form wing shapes. Glue to back of body. 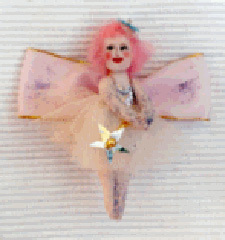 Sprinkle skirt and body with 'fairy dust' and sew a pin or broach back to Freya's back.